This title is sold out, and out of print. No orders for it can any longer be filled. Due to Boston's focus on other matters, and the emergence of of several new personalities, books, and websites on the subject, he has let his first book go out of print. Click here for a searchable current IRC; click here for the IRC's associated regulation; and click here for IRC definitions. 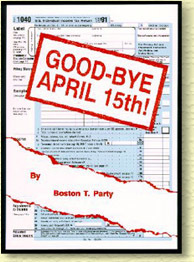 We thank the many readers, distributors, and supporters of Good-Bye April 15th!, and wish them success in their own quest for the freedoms once enjoyed by their grandparents.